Leftovers are the bane of my existence. I hate having bits and bobs, odds and ends from cooking projects cluttering up my counters, cupboards, and refrigerator. A half a bag of teff flour, 3/4 cup of alphabet pasta, and an amazing amount of egg whites interred in their tiny plastic coffins in the refrigerator are just a few of the things that make it hard to put away groceries. I have so many leftovers, that it's hard to find a place for actual food. Cooking camp, although it was a lot of fun, did have the aggravating side effect of producing more leftovers - a whole pan of marshmallows. I didn't want my kids to just hork down the whole pan as I'm not tall enough to be able to reach the ceiling to peel them off of it, were they to consume that much sugar. So, what to do with a pan of marshmallows? Recently on Pinterest I saw a delicious idea - s'more truffles. 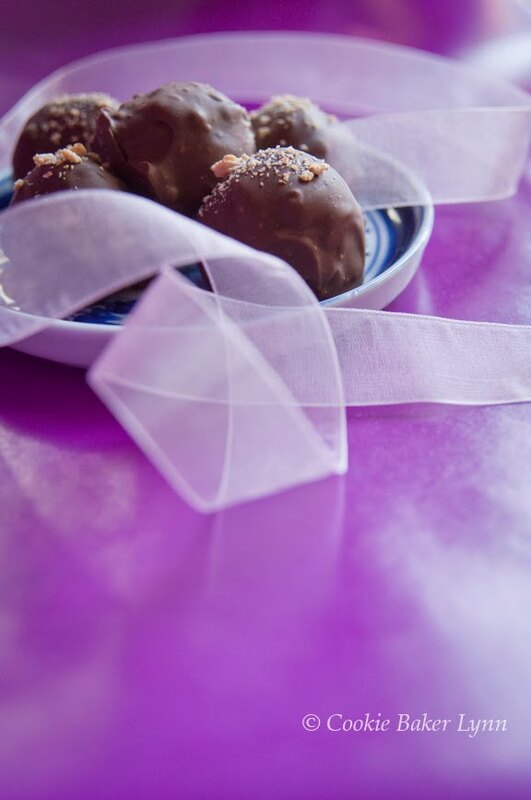 Leftover marshmallows seemed like a great excuse to make truffles. I played around and came up with my own recipe and they were delicious! I put little mini-muffin papers into an egg carton and sent some to work with my husband, some to youth group with my daughter, and gave some to visitors that stopped by. And the few that were leftover? Well, I'm not crazy enough to complain about leftover truffles! 1- Place chopped chocolate in medium heatproof bowl. 2- Combine whipping cream and espresso powder in medium saucepan. Bring cream mixture to simmer over medium-high heat, whisking occasionally. Pour cream mixture over chopped chocolate; let stand 1 minute, then whisk until chocolate is melted and mixture is smooth. 3- Place the chocolate mixture into the refrigerator to cool and thicken, about 2 hours. 4- Using kitchen shears, cut the marshmallows into the size of mini marshmallows. 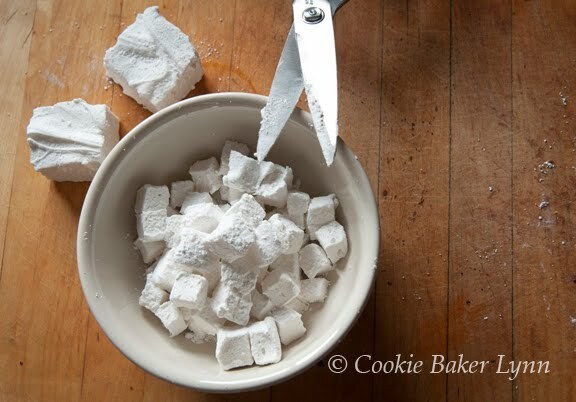 Dip the shears in powdered sugar frequently to keep them from gumming up. Rolls the mini marshmallows in the powdered sugar to keep them from sticking to each other, then shake off the excess sugar. 5- Place the graham cracker crumbs into a shallow bowl. Line two baking sheets with parchment paper. 6- Remove the thickened chocolate from the refrigerator. 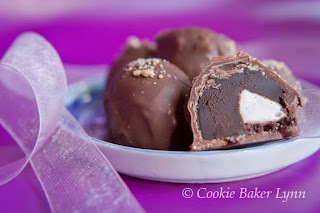 Using a small scoop (about Tbsp size), scoop up a ball of chocolate, smoosh a little marshmallow into the center, cover it over with chocolate, and drop the chocolate ball into the graham cracker crumbs, rolling it to coat it completely. Place the ball onto the prepared tray. 7- Repeat with the remaining chocolate and marshmallows. As soon as a tray is full, place it into the refrigerator. If you're working in a hot kitchen, you might need to work with only a portion of the chocolate at a time, keeping the rest in the refrigerator to stay firm. 8- Allow the chocolate balls to firm up in the refrigerator, from 1 hour to overnight. 9- Use the milk chocolate to dip the chocolate, following the tempering instructions in this post. Store the truffles in the refrigerator. These are a tasty treat and a great way to utilize those sweet leftovers from Cookie Camp, which I still love! I absolutely love this idea!! Brilliant! Just introduced my eldest to s'mores on a recent camping trip so I have the marshmallows ready in the freezer. I'll have to thaw some out and make a mini batch for a super treat. I'm pmsing and wishing I had a couple of those sitting right next to me so I could pop one into my mouth every time I feel emotionally out of whack...on second thought, I don't want a couple, I want the whole lot!! But you have to admit, isn't it the most wonderful thing the moment you realize there's leftover lasagna in the fridge? Brings a tear to my eye :). What an awesome idea! These look so, so good! I'm actually really fond of leftovers!Love putting together random meals of little odds and ends (and I certainly wouldn't mind some of YOUR leftovers judging by what you usually post :D). 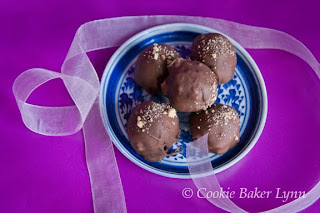 The s'more truffles sound really good nonetheless. Fall anticipation turned summer treat. Well thought. i get excited when leftovers are put to use in a way that's even better than their original purpose. that has occurred here--these little nibbles are amazing! Greetings from the Amish community of Lebanon,Pa. Richard from Amish Stories.